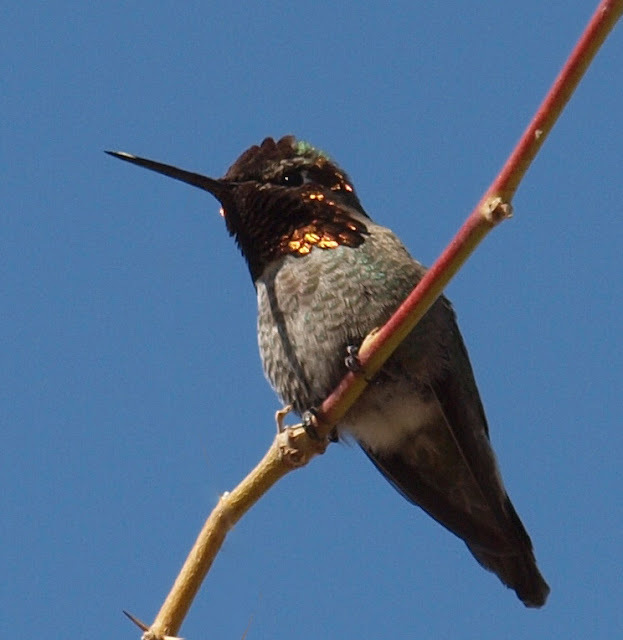 At the Gilbert Water Ranch in Arizona, there were dozens of male Anna's Hummingbirds. Ya know...I didn't see a single female. But I did see one male in particular that was doing his impressive courtship display. He would fly way up high and then come zipping down, then turn a u-shaped dip making a surprisingly loud buzzing-pop with its tail feathers. I assume a female was hidden somewhere nearby, unless this behavior is also part of territorial display and defense. This male did chase off several other males while I observed it. I was so excited about this that I went all Steve Irwin (the late Crocodile Hunter) on the innocent passers-by, exuberantly showing them the hummingbird and describing for them the behavior we were privileged to be witnessing. Either they too found the behavior as exciting as I did or they got caught up in my enthusiasm, because I had quite a large group of non-birders, both old and young, gathered watching and oohing and ahhing at the beautiful little bird putting on quite a show. While the tiny hummer made dozens of these flights and dips and pops and we all stood there captivated by the spectacle, I heard comments like: "Oh my goodness, he goes so high!" "Heeeeeeere he comes! ", "Wow! Did you hear that?!" "Amazing! I've never seen anything like it." "Oh, I didn't know hummingbirds rested on branches too. I thought they flew their entire lives." "Check out the neon pink head!" "Thanks for showing us!" Yes, it was a small, but great moment in birding public relations, thanks to the magic of nature! Happy Birding! Check out this link to Rich Ditch's Anna's Hummingbird photo from the same location. Wonderful post Robert. I bet a few of those people will soon become birders! What a beauty, I love his vivid colors. You captured some awesome shots of him, Robert. How nice to be able to share your enthusiasm with an appreciative audience. This display is awesome and I, too, enjoy pointing it out to people. Very nice photos! I have an Anna's nesting in my yard. Great post, Robert! Love watching the hummers, particularly as the males do their "U" display flight ... so impressive! I so enjoyed reading this post! It put a big smile on my face. During the spring and summer months we have lots (too many to count) of Ruby-throated Hummingbirds visiting our feeders. Observing their aerial displays is quite entertaining. Fantastic images, Robert! I wonder if you inspired several of those hummingbird viewers to become birders ... I bet so! Beautiful little Anna's Hummingbird! That's awesome Robert, nice shots! The Water Ranch is such a great spot. I had a similar experience there photographing an Anna's. They Hummers are pretty close to the sidewalks, and there were lots of other people with whom I shared the acrobatic bird. They all loved. They're some of the best publicity agents for birding, no doubt. Neat experience, for you and your onlookers Robert. Nice photos and post. Rich Ditch is a friend and one of the most knowledgeable birders and photographers out there - excellent choice of links. Hummingbirds are so beautiful, especially the Anna's Hummingbird. You took some great photos Robert. @Mia - Thx! I hope a little birding enthusiasm rubbed off on those people which leads to greater interest in nature and wildlife. @Pam - Thanks for the nice comment. @Carole - glad to hear that others get so excited they have to share with the innocent passers-by! @Jim - Thx! That hummer display is really cool. @Julie - Glad it made you smile! @Laurence - that's great that you too share such cool behavior with others. I like how you phrased it about the hummers being great publicity agents for birding. @Ruby - Thanks so much! @Ron - Rich Ditch is a great photographer. He helped judge a couple photo contests I've had hear on the blog. @Rohrerbot - Great to hear about your hummers. You live in prime hummingbird territory for the United States. I'm jealous. @Prairie Birder - Thanks so much! An excellent accounting of your experience Robert! What a wonderful thing to share with the general public to get them interested in birding. It is one of the most important aspects of birding in my view, helping others appreciate nature. We have Anna's Hummingbirds here year round and see their dive displays often. When I researched this phenomenon for a past post I discovered that, yes, the males do use this display as a courtship behavior to females and as a territorial display towards other males. Also interesting to note is that they always orient themselves facing the sun while doing their dive display. With this orientation, the colors of their gorget are the brightest they can be for their intended audience. Therefore, when you look for the display recipient, you will always find her or him near the bottom of the "U" in the direction the male is facing! This time of year many Anna's females are already nesting and consequently we see predominately males. I only catch glimpses of the females at the feeders or collecting nesting material. I've also noticed that I'm not getting that many hummers at the feeders lately. I think it's because there are many plants in bloom, including the Manzanita here.